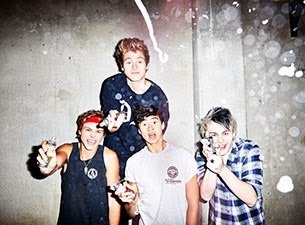 It's official: 5 Seconds Of Summer are in the recording studio working on new music. The band have been posting pictures on their Twitter account of them in the studio hard at work on new material. And according to a post from yesterday, the Aussie pop-rock four-piece were writing a new song with Marianas Trench frontman Josh Ramsay. It's not clear of when 5SOS are planning on releasing a collection of new material, but we're hoping it'll be before the year is over!